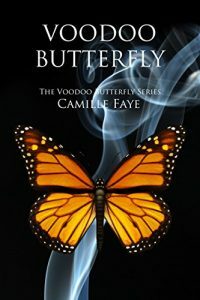 Author Camille Faye is a world traveler, experienced journalist, writing teacher, wife, mother, and author of the paranormal romance books, The Voodoo Butterfly Series, which developed from her experience of growing up in a haunted house. Camille took time to give an amazing interview in which she offers advice on publishing, writing, and not giving up. 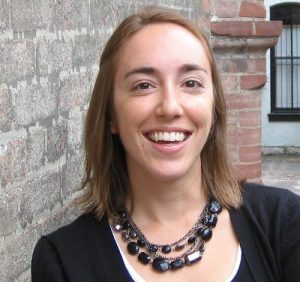 Kathryn Schleich: You have an extensive background in different types of writing. Describe your writing career prior to writing your first novel. Camille Faye: I wrote for my high school and college newspapers, so that’s going way back. Ha! Then part of my bachelor’s degree in broadcast journalism included working as a reporter at the local NBC station in Columbia, Missouri, so I wrote news scripts there. After that, I used my master’s in English to teach writing at the college level. KS: You have traveled extensively and mention your travels definitely influence your writing. Tell us about them. CF: In college I did a semester abroad in London and was able to visit many European countries. In addition to that, my husband is from Malaysia and we go visit his family there so we have been exploring Southeast Asia. I also have a sister in Australia, so I’ve been there to visit, as well. I love traveling because you get to learn about very different customs and cultures and it’s always an adventure! KS: The Voodoo Butterfly Series was inspired by your growing up in a haunted house, an experience few people can relate to. How did you come to realize the house was haunted? Was that a known fact from the other owner of the haunting origins? CF: We didn’t know the house was haunted when my parents bought it, but we had heard there was a couple of deaths on the property. One was a farming accident and the other was old age. We started noticing lights going on and off by themselves with no faulty wiring. The piano keys would play random notes. My mom got punched in the leg while she was sleeping one night. And the creepiest thing that happened to me was I woke one night to something tapping me on the head. I kept my eyes closed and pretended to sleep, but it went on for about 20 minutes. I just prayed really hard–being a good, Catholic girl–and eventually fell back asleep. KS: What are you working on currently? 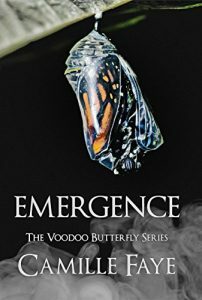 CF: The fourth book in the The Voodoo Butterfly Series. KS: Have either of your kids caught the writing bug? CF: My six-year-old LOVES making books at school and at home. She staples paper together, then writes and draws on the pages of her books. My eleven-year-old worked on a science fiction short story for class, so that was a lot of fun to read. He does great writing humor which, I think, is super tough. KS: Did you undertake publication with agent or querying publishers of paranormal romance? CF: For the first five years, I tried a few different ways to get published. Querying editors and agents through email did not work for me, but when I would pitch in person at conferences, every agent and editor requested my manuscript (about 15 read Voodoo Butterfly). I broke into traditional publishing when I placed 2nd in the nationwide Lone Star Contest for paranormal romance. My publisher, Soul Mate Publishing, was one of the judges of the contest and offered me a contract. KS: What’s the best writing advice you’ve ever received? CF: Write daily. It’s very hard to stay in your story, especially a novel-length work, if you are not working every day. It doesn’t have to be an hours-long commitment. Just commit to fifteen minutes if that’s all you can do. In fact, I wrote the first draft of Voodoo Butterfly in one year by committing to fifteen minutes per day, so it’s possible! KS: Any thing you’d like to add? CF: The third book in The Voodoo Butterfly Series, titled Flight, releases in April 2019. Readers can find the first two books in the series on Amazon. For more information on Camille and her books, visit her website at: camillefaye.com.